F1Hybrids Savannahs was started in 2006 by Michelle Tuck. Over eleven years later we are still striving to produce the best Savannah Cats. Welcome to F1Hybrids Savannahs, my name is Michelle Tuck (Formally Michelle Mills). Alongside my husband Ryan Tuck, we live on a 10-acre working farm. We are located just outside Knoxville, Tennessee. Our home is part of the green belt in the foothills of the Great Smoky Mountains. Just a short distance from the famous Pigeon Forge, Dollywood, BlackBerry Farm and Cades Cove. "F1hybrids" was registered in 2006 with TICA, The International Cat Association. TICA is the world's largest genetic registry of pedigreed cats. The organization has a genetic registry for pedigreed and household pet cats and is one of the world's largest sanctioning bodies for cat shows. From 2006-2011 I worked with all generations of Savannah Cat, some of which have gone on to further other programs around the world. In 2011 fortune shined down upon me and blessed me with my first foundation F1 Savannah Cats. By even greater luck the pairing was produced by an F2 Savannah Cat to Serval Cat, which is a very rare and difficult cross. Experienced in raising all generations I made the decision that lower generations were not advanced enough at that time to provide the type of cat desired by pet owners. So in 2011, I turned my focus to F1 Savannahs & F2 Savannahs, with the goal of breeding SV to SV to get exceptional lower generations. 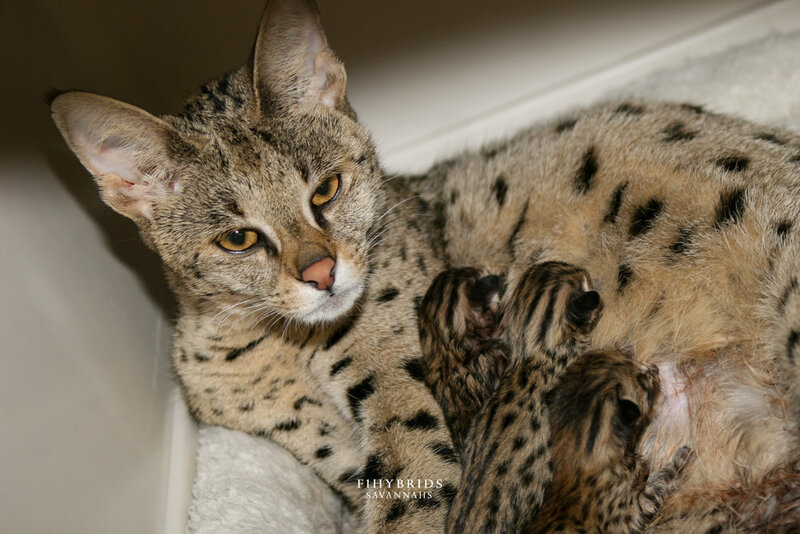 Experience raising F1 Savannah litters taught me that most homes require the lower energy of an F2 Savannah Cat that can not be found in F1's. 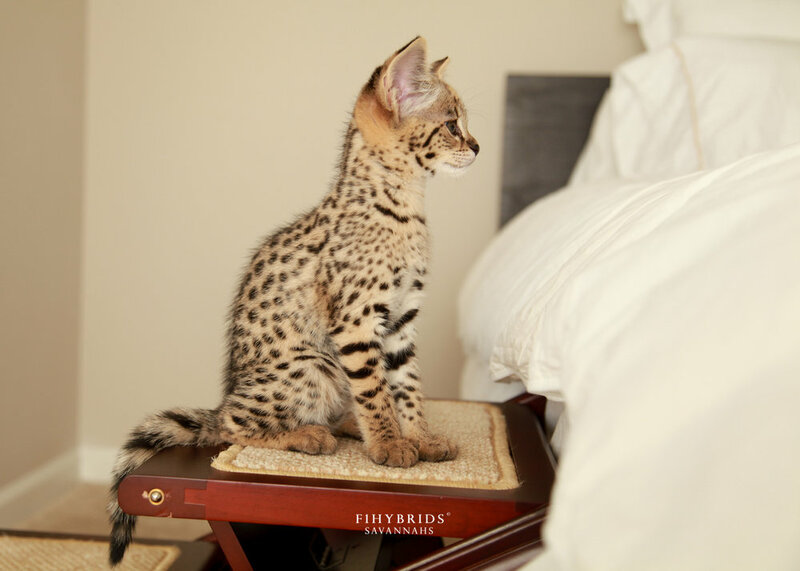 My focus now is to produce the highest quality F2 Savannah Cats. Breed Development can not happen properly without the strong relationships forged by breeders working together. I would like to thanks the breeders who have worked with me over the years.I owe thanks to my dearest friend, Sue Armstrong of Amara Savannahs. Sue Armstrong has been around form the start of Savannah Cats and Bengal Cats (Over 25 years of experience). Her efforts produced cats that have helped shaped the breed. I also wish to thank my wonderful friend Mery B. Peek of Ivorycoast Savannahs (Retired). Ivorycoast can be found in many pedigrees as she worked hard producing many foundation cats. Her work early on in developing fertile lower generations should not be forgotten. Savannah Kittens are raised in my home, which the adult cats also visit. My "kitten area" is an entire 1,500 sqft area in our house. Which is a cat paradise full of toys. Equipped with a nursery room and extra large teenager room. It is organized chaos that is always clean and well maintained. When raising our kittens we apply what we call a "Kitten Development Program" that is based off; Puppy Culture by Jane Messineo Lindquist (Killion). Our new cattery is beginning with a 70 wide x 70 long X 25 high building. Designed for proper animal husbandry with large spacing of exterior for premium ventilation, maximum natural light plus viewing pleasure, proper drainage and enrichment activities (Kiddy pool, vertical space, plants, toys, perches, radio). Adults have a large communal play section. They also have a unique buddy system that connects designated female pairs together, custom designed to be divided when pregnant, since pregnant females are territorial. Corn feilds behind our property. Picking blackberries in back pasture. Tuck's sister visitng with an F1 Savannah. We have one wonderful rescue dog, Hermes. Hermes is a tab too much for the kittens but they do get the idea of don't get caught under his rambunctious paws. He is careful with the kittens (when hes not excited), teaching them life lessons. Taking proper care of the cats takes up majority of my time. A few of my hobbies include photography, website design and going to work along side my husband Ryan Tuck. He is a Professional Horse Farrier and Blacksmith. Combined we have over 40 years of animal husbandry experience. We often work with other equine professionals in our area which has resulted in working on horses at the University of Tennessee College of Veterinary Medicine, Dolly Parton's Dixie Stampede and Blackberry Farm. He has also has been a Race Horse Jokey (Riding Eclipse Award Winning Horses), Radiograph Vet Technician, Professional Musician and PRCA professional bull rider. He is a top hand in animal husbandry making him a perfect "Catman".